I have a few s’mores recipes on The Crafting Foodie – like these killer S’more Sandwich Cookies and these S’more Cupcakes. 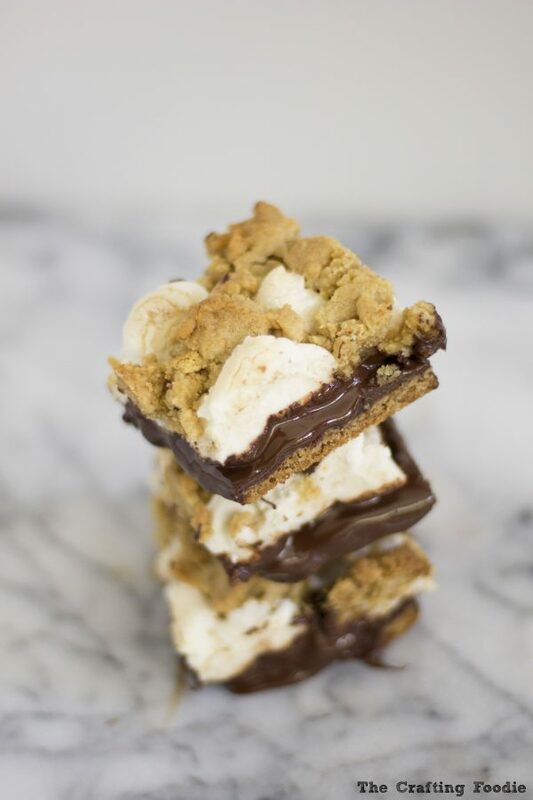 But this summer, I was looking for an easy, quick s’mores recipe that elevated that elevated the treat into to a well-balanced, multi-textured dessert. And ta-da these S’mores Bars were born. That meant the sweetness in these S’mores Bars had to be toned down – way down. While I love dessert just as much as the next sweet-toothed baker, if something is too sweet, it can taste like nothing but sugar. And let’s be honest, plain old sugar can be bland. Very bland. My solution was to swap out the milk chocolate for dark chocolate. I like to use chocolate that is at least 70% cacao. The bitterness in the chocolate balances out the extreme sweetness from the marshmallows. And to bring out the flavor of the cookie crust and topping in these S’mores Bars, I added vanilla and a little extra salt. I always bake and cook with kosher salt. I prefer the larger grains for a burst of saltiness. 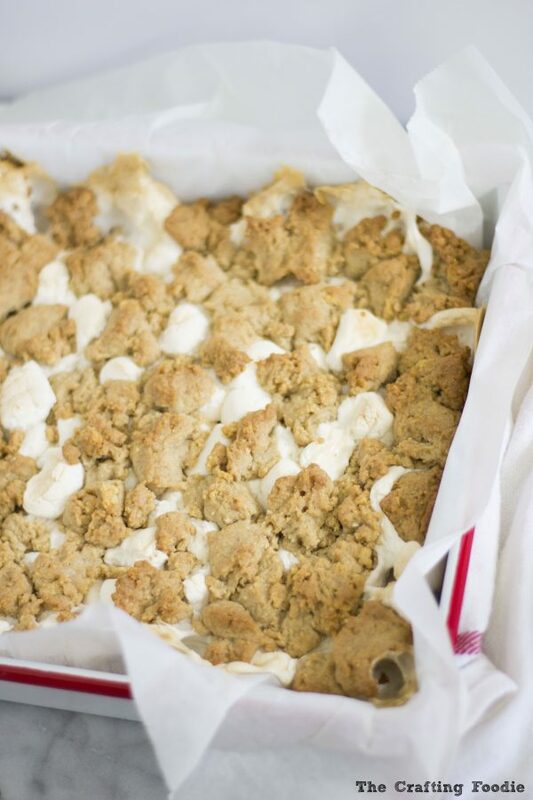 Wanting to break up the soft, gooey texture of these S’mores Bars, I added extra graham cracker crumbs to the cookie dough base and topping so that as it cooked, the edges browned and got a little crisp. Putting it all together, these S’mores Bars feature all the traditional flavors of a s’more, but with an amped up cookie dough base (thanks to the vanilla and extra salt) and a darker, richer chocolate filling from the 70% cocoa chocolate. 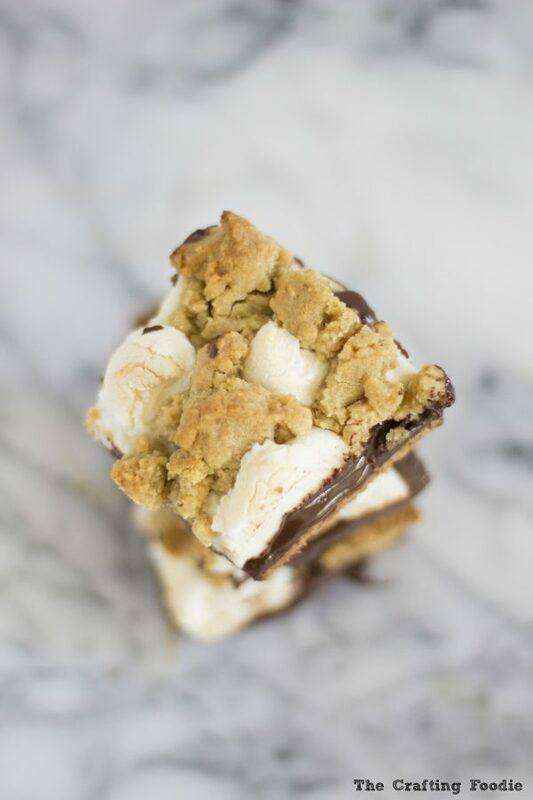 And all of the deliciousness in these S’mores Bars is accomplished while still featuring a variety of textures – the gooey marshmallows, rich, silky chocolate filling, and the crisp, buttery graham cracker cookie base and topping. These simple S’mores Bars are quite near perfection. If you follow me on Instagram (which you really should, and you can do so right here: @thecraftingfoodie), you know that these S’mores Bars have shown up on my Instagram stories almost half a dozen times in the past 2 weeks. Each batch was the product of a specific request. And those requests keep on coming. I brought a huge tray of these to a 4th of July picnic, and they were gone within half an hour. To say they’re beloved by my friends and family is an understatement. 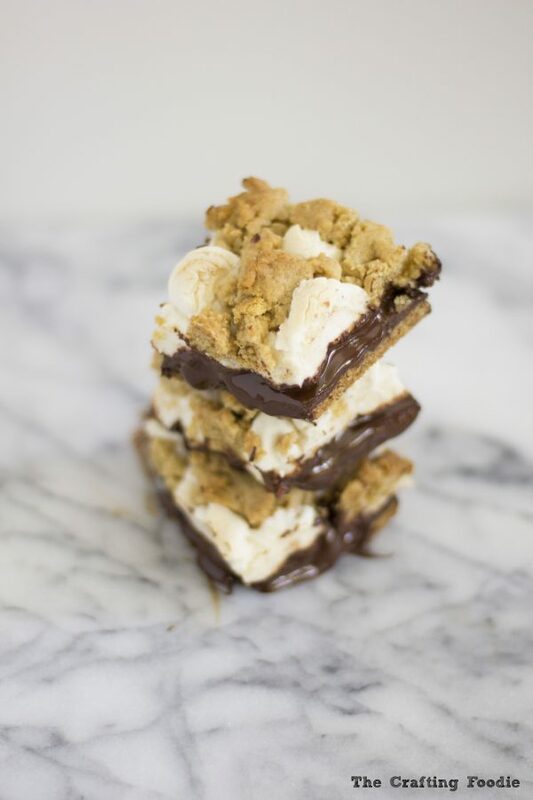 Once you make these S’mores Bars, I promise they’ll be a regular in your summer dessert rotation. They are an easy, delicious, well-balanced crowd pleaser! Line an 8x8 inch square baking sheet with parchment paper and grease the paper. 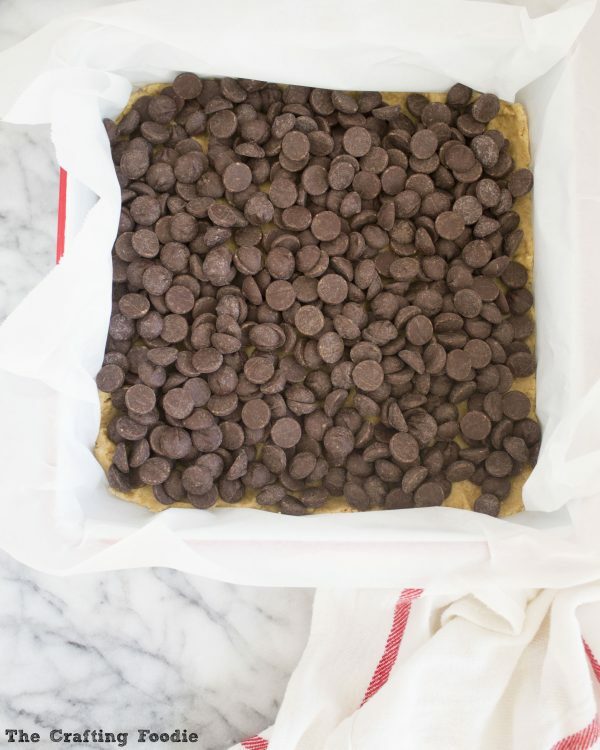 *You can easily make a large batch of these bars by making 1½ times the recipe and using a half-sheet pan. It works perfectly. In a medium bowl, whisk together the flour, graham cracker crumbs, baking soda and salt. Set aside. In the bowl of a standing mixer fitted with a paddle attachment, cream the butter and sugars together until fluffy (about 2 to 3 minutes on medium). Half the graham cracker cookie dough. Working with one half of the dough, press it into an even layer covering the surface of the pan. Once smoothed, sprinkle over the chocolate. Next sprinkle the marshmallows in an even layer over the chocolate. Using the reserved graham cracker cookie dough, pinch off pieces of the dough, and nestle the pieces among the marshmallows. Bake for 27-30 minutes or until the marshmallows are toasty and brown. I’ve got to pin these for later when my nephews come in a few weeks. They’ll love them! These look great! I love the fact that their a little less messy than regular smores and can pack them for on the go! Thanks, Kate! I hear you on the messiness. If you refrigerate them before slicing, they’re even easier to pack up without any mess. But if you like the melty chocolate of a traditional s’more, then slice into the bars when still warm! This is awesome! I just got back from camping and have extra smores supplies that need to be used up. This is the perfect solution! So glad to help use up your extra supplies, Deborah! I bet you’ll be stocking up on s’mores supplies after making this. It’s dangerously easy to make, and it’s so darn delicious! I love it, they look so good and delicious. The problem is I don’t think they would last long in my house. I’d have to hide some bites for myself, thank you for sharing, pinning it for reference. Thanks, Joan! I hear you – I can’t even nibble on them when I’m making them because they’re too addictive. My tip is to make them when your heading to someone’s house. That way you can enjoy one (or two), and share it with everyone. These look awesome! I’ll take s’mores bars over regular s’mores any day! These look so gooey and amazing!!! I’m on a real s’mores kick lately since Starbucks brought back their frap but these homemade goodies look so much better. Pinning for later! Pinning these for later. They look delicious!! 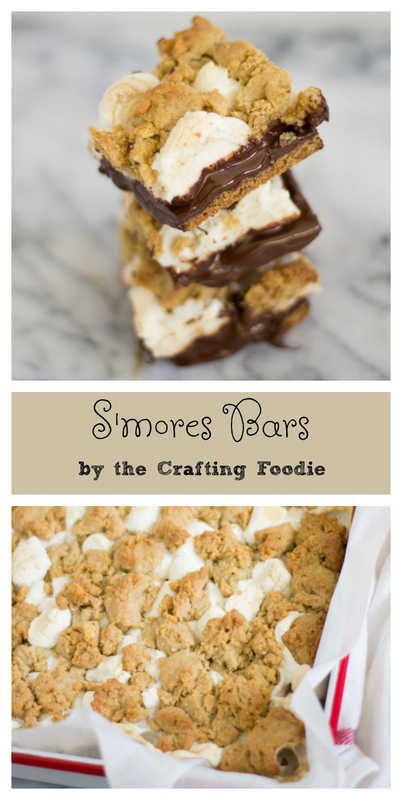 I am smores obsessed, so these look right up my ally!! I can’t wait to give this delicious summer treat a try! Absolutely pinning this to make later! They look amazing! Thanks, Kayla! Fruit pies are such an easy dessert to make, and they’re perfect for the summer!